Let’s say you write a perfect email. Truly brilliant - witty, useful for the readers, answering questions they’re possibly struggling with. And yet, the outcome is far from amazing, the letter is not even opened by most recipients. Why is that? You may have already guessed the core of the problem. Yes, it’s the subject line. It’s not necessarily the case every time your emails fail to demonstrate good open rate results, but very often this is the place where you initially should start looking for reasons. Let’s have a closer look at strategies and ideas for writing subject lines that work for your business, and help you achieve more with content marketing, namely, email marketing. Be straightforward with the reasons why your email is worth something. More importantly, why it’s worth your recipient’s time. We don’t feel the lack of emails in 2017, do we? And none of us is thrilled about going through every single email in the inbox hoping to find the one, that will blow the mind and change the world entirely. Nope, it doesn’t work this way. Either we are hooked by the subject line, open the email, and read it, or keep scrolling. Bottom line is, clear benefit in the subject line makes people stop for a second and consider opening it. The fear of missing an opportunity can be the driving force encouraging recipients to open the email and get the benefits you’re promising asap. The only caveat we should make here is that playing the urgency card only makes sense if you do have some urgent offer to make. Otherwise you’ll just be deceiving your readers, and even if you manage to make them open the email, the click-through rate can be very low. If you’re just sharing some company news or the latest blog post, there’s no need to put pressure on your recipients forcing them to act immediately. Once again, it can work for the first time, but will definitely backfire late. Another tricky element in our formula. According to an experiment made by Experian Marketing Services in 2015, addressing recipients by name in subject lines can increase open rates by 29%. There’s a but, however. First of all, the numbers are different within industries. As you can see, personalized subject lines work much better when it comes to selling products and services, and don’t work at all on publishers. 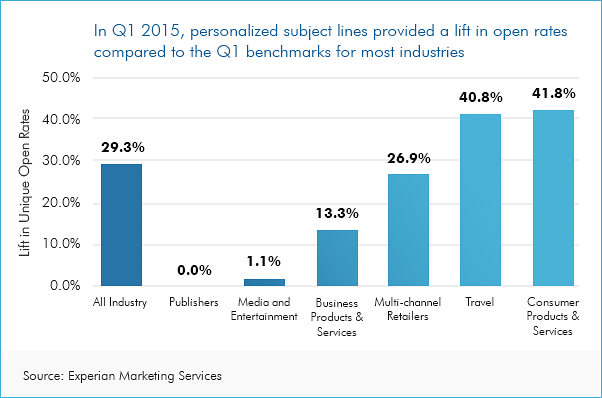 So this is the first thing to keep in mind when compiling a subject line with personalization touch. Some second thoughts should also be given to the appropriateness of personalization. If you and your recipient only get to know each other, it’s not a good time to take liberties. Wait till the reader makes the first purchase or joins your loyalty program. Birthday email with a personalized subject line is also a great way to get closer with your recipients. It’s obvious now that the formula we provided earlier is quite vague and needs to be adjusted according to your needs and the needs of your recipients, the relationships between you, and the stage of the funnel they are at. What’s more, that formula works best when you’re trying to close sales, but you are not going to send promotional emails all the time, are you? That’s why, try to combine different approaches to writing subject lines, be creative, and look for ideas in your own inbox. Below is the list of subject lines grouped in 6 categories. Depending on any particular email you’re planning to send you can mix them up to receive the subject line that best describes and promotes the contents of the email. These kinds of subject lines should be as specific as possible, ideally, marking the flow of the email in a nutshell. If possible, use numbers to give recipients the understanding of the way they have to take. Very few people would want to go on a journey not knowing how long it will take. We’ve talked about urgency earlier, and the rule still applies - play this card if your offer is limited in time. Don’t do it just to make people open the email. Negative emotions is a tricky thing in content marketing. They don’t usually help get a better response from readers, but when combined with such emotions like anticipation or curiosity, can actually help your content get some extra reaction from the readers. The following subject lines are the examples of such winning combination. No extra words are needed here, as curiosity and interest are the initial reasons for most of us to open and read any piece of content. For serious people looking for serious information. That doesn’t mean, though, that such emails should bore you to death from the very first line. Add some anticipation or a short spoiler to get the recipients hooked. When everything serious and important has been already said, go for humor. A good joke or a fun metaphor in the subject line will always be a good starting point for an email. What are the subject lines that worked for you? Do you have your own formula for writing subject lines that always get your emails opened? Please, share in the comment below, we'll be happy to chat. If you found the info we gave here helpful, share the post with your friends and colleagues - spread the word to get emails with stunning subject lines in your inbox.